Why did Mt. Gox fail? It has been a big week for bitcoin. Newsweek claimed they found the creator of bitcoin, who went by the supposed pseudonym Satoshi Nakamoto but actually was born with the name Satoshi Nakamoto. Calls for regulation of bitcoin appeared all over the place, for example at an investment research firm Casey Research. A Canadian exchange dropped U.S. customers because of U.S. regulations already in place. The size of the loss at Mt. Gox became clear with a lot of speculation about how it happened. How did Mt. Gox manage to lose half a billion dollars? A couple of guys with computers happened to be in Tokyo and half a billion dollars went missing (an observation made by a lawyer in a Wall Street Journal interview). It seems incredible. It is easy to forget how large the increase in the price of bitcoin is over a couple of years. 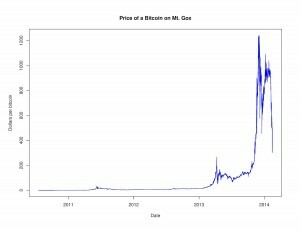 The adjoining chart shows the price of bitcoin in dollars on Mt. 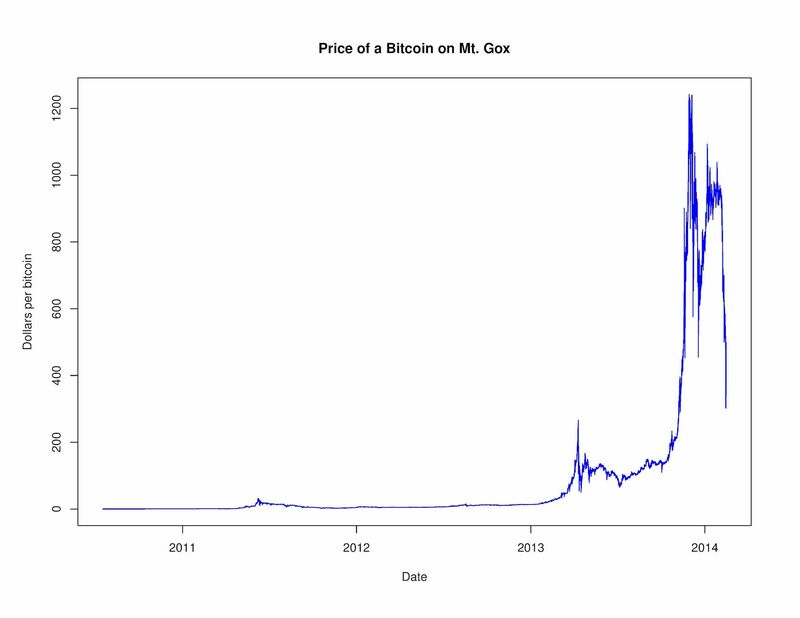 Gox from the start of trading in 2010 until the day before trading ended. The first trades were at $.05 per bitcoin. Now bitcoins are trading at about $600 (on other exchanges of course). Mt. Gox appears to have a loss of about 850,000 bitcoins. Valued at $600 per bitcoin, this is half a billion dollars. Valued at five cents per bitcoin, this is $42,500. The loss changes from huge to smaller than most personal bankruptcies in the United States, depending on the price of bitcoin. It’s the loss in dollars that matters in most ways. Is this small loss at another price just an interesting tidbit? No, it is an important piece of the puzzle of where the half billion dollars went. I will suppose that Mark Karpeles did not intend to defraud anyone. I seriously doubt he is the Bernie Madoff of bitcoin. (He’s not as successful for as long; that’s for sure.) It’s more likely that he is what he seems: a programmer who became interested in bitcoin and got involved in exciting developments by running an exchange. Software issues and fraud by some customers probably did contribute to Mt. Gox’s failure, although it is hard to explain the magnitude of the loss by them alone, a point made by Emin Sirer. Mismanagement probably also played a role. Based on many episodes in the past, there is a relatively simple and plausible explanation. Mt. Gox was a startup in 2010. The available evidence indicates it had relatively little capital. In some ways, the whole thing may have been more like a lark than the start of a very big business. Initially there were not all that many trades and negative cash flow was likely. How to pay the bills? It would be easy and seem harmless to take a small part of the inflow of bitcoins from customers and use them to pay bills. You might think this is fraud or otherwise evil, but I found no promise by Mt. Gox that it would keep customers’ funds separate from the exchange’s funds when I was thinking about using Mt. Gox to buy bitcoins. To a programmer, as opposed to a financial economist, I can see why this would not seem like a big deal. The implications of this are large though. Mt. Gox now is short bitcoins early on. Being short bitcoins is similar to being short stock. Going short is the same as selling now and buying them back later. If the price goes down, this is selling high and buying low. If the price goes up, this is selling low and buying high. An increase from $.05 to $600 is huge. A debt of $2.00 to cover the cost of a cup of coffee – 40 bitcoins – becomes a debt of $24,000. A couple of cups of coffee and suddenly it is serious money! Losses due to fraudulent withdrawals may well have contributed to the large loss. Especially if the losses due to fraud by customers happened when the price was lower, for example $100 just a year ago, that loss of a $100 bitcoin becomes the loss of a $600 bitcoin today. How does an initially small and later larger debt get translated into losing 850,000 bitcoins and having little cash? Redemptions on Mt. Gox in the last eight months or so were in bitcoins, not dollars. Starting in 2013 and especially in Summer 2013, Mt. Gox was having trouble transferring funds to U.S. customers. The price of bitcoins in dollars was higher on Mt. Gox than elsewhere, consistent with a difficulty of redeeming in dollars. A U.S. customer would redeem in bitcoins, not dollars. Instead of a constant inflow of bitcoins and dollars, there was a constant outflow of bitcoins because of Mt. Gox’s difficulties. Mt. Gox redeemed and bitcoins went away. At the same time, there were not that many dollars because the small initial short position became a very large loss. Is this likely to be all the story? History suggests not. When people get into difficulties, they do things that seem mysterious, goofy or even stupid in hindsight. It would be surprising if nothing like that happened. Still, Mt. Gox is likely to have been in the wrong place at the wrong time, experiencing the opposite of some others’ good fortune. One graduate student bought $27 worth of bitcoins and later cashed in a fifth of them to buy a nice apartment. Mt. Gox likely had the bad luck, borrowing a small amount, maybe losing a small amount other ways, and ending up short bitcoins early on. The small debt became a very large one and the drain of bitcoins made the magnitude of the loss evident. This entry was posted in Bitcoin, Mt. Gox, Private digital currency on March 8, 2014 by gpdwyer.